Virtual reality mostly associated with the entertainment. But it can significantly improve the lives of patients also who have autism, pain, etc. Training medical students are one of the prime uses of Virtual Reality Videos in Healthcare and apart from that virtual organ models are helping surgeons to prepare for complicated surgeries. Virtual reality is changing the face of medicine not only for doctors but also for the patients as well. VR can help phobia patients get over their fears with VR therapy. 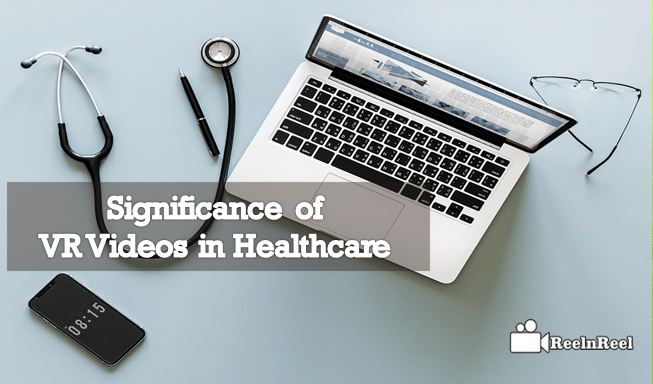 360-degree videos can be used to train people in healthcare to perform better at a task. Favorite medical schools are making 360-degree videos a part of their curriculum. Complicated surgical procedures are shown to the students in 360-degree videos which are interactive. The students can practice and perfect them. More and more training tools are being developed to create immersive video modules which the students can access using their mobile apps. 360-degree immersive videos are created that enable students to observe surgeries closely. The students can explore the human anatomy. Human nervous system, muscles, and bones or cardiovascular systems can be investigated using VR. Virtual reality is getting better. Most exciting applications are being created in healthcare. Doctors, as well as patients, are getting benefit from VR. Virtual reality videos can be potentially used as a therapeutic tool. VR videos are being used to treat pain, stress, and anxiety. Healthcare video also is a cost-saving tool for medical healthcare training. The videos created can be accessed on mobile and desktop devices. This saves money, time and energy as the trainers can avoid going to the training sessions personally. VR videos are also used to explain people understand the effects of smoking or alcohol. Showing adverse effects of tobacco and alcohol through VR is believed to discourage younger generations to stop these habits. Healthcare industry is changing rapidly. Virtual reality videos in healthcare are predicated on generating billions of dollars in the coming few years. The two areas where VR videos are most utilized are the trainiHealthcare gets Innovative with VR Videosng and the rehabilitation. VR videos enable the medical professionals anywhere in the world to see and use them for training purposes. Young doctors can be trained using the immersive 3D operative room simulations in real life situations. This helps them gain experience and improve their skills to save lives. Eve professionals can fine-tune their skills using these videos. VR videos are developed that show colonoscopy, laparoscopy, robotic and also organ transplant surgeries. VR videos were showing breathing control and meditation help patients to relax and control their breathing. This helps in lessening pain. Another innovative way VR is used in healthcare is for the drug addicts. There are millions of people with drug use disorders. VR is being used to help individuals learn to deal with the temptation of drugs. Physical rehabilitation is getting more pleasant with VR. Patients terrified of the treatment that they are getting can get help from VR videos understand what is ahead. They also can understand how to deal with their medical condition. Though entertainment and gaming are the two popular areas when it comes to usage of virtual reality, there are other areas such as medicine which is gradually adopting and applying this technology. Virtual Reality is being used to help patients get relief from pain and stress. One example is the video of KindVR which helps Sickle Cell Disease patients remove focus from their pain. Medical virtual reality is also being used for medical training. Students are allowed to perform hands-on procedures in safe and controlled setting preventing any risk to the patients as the students might make mistakes. Dentistry is another critical area where VR is playing an important role. The students can perform the range of virtual procedures and improve their skills and adjust their technique. VR is also used to train paramedics to learn life-saving skills. Another use of virtual reality in medicine is to educate patients about the need to stop smoking, alcohol intake and make positive changes to their lifestyle such as healthy eating and exercise. VR is being used for varying purposes in medicine. People are using VR to improve research and to reach broader audiences. Documentaries are being made in virtual reality in medicine, and one of such documentaries is ‘To Err is Human.’ This documentary focuses on preventable medical errors and issues. There are other documentaries available online. Virtual reality in medicine can revolutionize the whole industry. Apart from training students, VR is also used as a tool for effectively treating mental disorders. It can increase modern medicine level all over the world. This technology can help the medical specialists, surgeons, dentists, and physicians to learn the skills without risking human lives. Computer technology is advancing, and along with it, VR solutions are also continuing to progress. Virtual reality is producing impactful experiences for the users. It is improving diagnostics, predicting outcomes and is also changing the way doctors are planning to provide care for the patients. The numerous benefits and uses of virtual reality are taking the industry by storm. By using this technology, innovative advancements are being brought in healthcare.